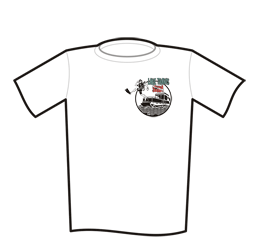 Order by phone 512-784-5980 or email robert@laketravisscuba.com. 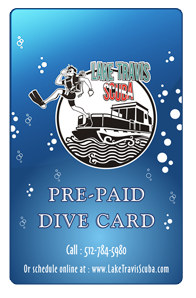 Frequent divers save by purchasing a Prepaid Dive Card. For every four charters purchased you receive one free charter, a 20% discount off regular price. Cost is $45 (tax not included in price) for a two-tank charter. Card is enclosed in a laminated luggage tag so you can attach it to your gear bag. Gift Certificate Cards are perfect as a gift for your favorite diver, dive buddy or just for yourself. Gift cards can be purchased with one, two or up to 10 charters. Receive one free charter with the purchase of four charters at regular price. T-shirts are always a hit with divers. These ash gray T's are available in small, medium, large, XL, XXL. Let your friends know you are a Lake Travis Scuba Diver.